As well as playing in tournaments all over the UK and Europe, we like to make sure there are plenty of opportunities to play good quality, competitive Ultimate locally. We stage Leagues and Tournaments in and around Glasgow that help introduce new players to the sport and give our existing members a chance to hone their skills. Runs from June to September in the west end of Glasgow. Players join as individuals and are sorted into teams by the league. Beginners and seasoned veterans alike play together. 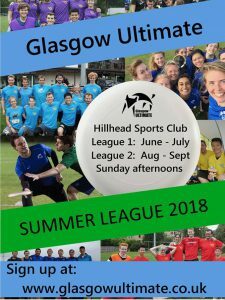 Games are on Sunday afternoons at Hillhead Sports Club, there is also club training on Wednesday evenings and Sundays before league games. Enter as an individual here and we’ll put you on a team. All players need to at least have a basic UKU membership to participate (£5 see the form). You also need to pay Glasgow Ultimate club membership (£20 per league) or pay as you go (£5 per Sunday or Wednesday).